Cupcakes 'n Daisies: Well it's Monday . 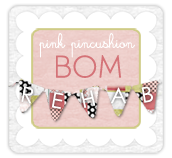 . .
that means it's time for another BOM Rehab update! I hope you're not getting bored with these Northern Lights blocks, I'm not getting bored piecing them. Probably because I'm doing one a week. And it doesn't even take more than a couple of hours to cut and piece each one of these blocks, which are huge, 16 1/2". So now I'm up to 5 focus blocks pieced, two more to go! And here is a general idea of what it's going to look like when it's set. Just in case you're new to my blog, the pattern is Northern Lights by Marti Michell. 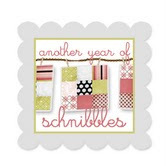 Last week I was a winner for Sinta's monthly BOM Rehab drawing, woo hoo! If you have a BOM you could drag out of your closet and work on, do it, and join in the fun. Those are big. :) Gorgeous blocks, lovely muted fabrics. I like seeing your weekly BOM - it gives me hope that the BOM (complete kit) that I have in a drawer might get pulled out and worked on some day! I like yours a whole lot better than the one I have - that'll give you a clue as to why it's still in the drawer. I never tire watching your progress on Northern Lights ! It is GORGEOUS! I also have been working on my BOM Vintage Rouge and only have #4 , #5 & #6 month to go ! I will be done with it October ! Congrats on be Sinta's winner !!!! I'm glad you're finishing this one, Thelma. It's striking in its simplicity. Pretty perfect pinwheels! Enjoy seeing your posts on this BOM. It's hard to get motivated to work when I have so many quilt blogs to check into and see what everyone's been doing!! :) Have a great week! i finished two blocks a large and a small bounce they are up on my blog (diana-runswithdogs.blogspot.com)no it is not my indian name lol!